Bajan salt bread hot out the oven. It is rare for me to buy bread. Not because I don’t like it or as some folks would say, “I’m trying to not eat too much flour,” but because I bake my own bread. It is a family tradition dating back several generations. My maternal grandparents hail from lovely St. Vincent and the Grenadines, where unlike my homeland Barbados, it is commonplace for families to bake their own bread. All 11 of my grandparents’ children and their children bake bread. I grew up watching my mother make every type of Caribbean bread, cake, pastry etc, and her skills were so stellar, neighbors offered to pay her to bake. Baking thus became a key aspect of her livelihood. Mommy didn’t sell everything she baked though; she would often take some to church and share with members of the congregation, drop off a few by a friend’s house or call and invite them over for the freshly baked goodies. If that wasn’t enough, she’d cut me a handful of slices to take to school and share with my friends, and package some for my favorite teacher or the principal. Years later, when I started working as a reporter, she would send similar treats for my colleagues, many of whom became her loyal customers. 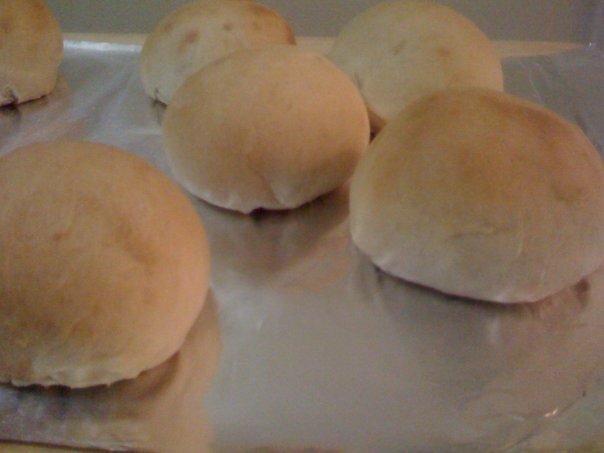 I can still remember my first time baking bread. Mommy called home and instructed me “knead the flour.” Mind you, she had never actually taught me how to bake, but given that I would have seen her do it countless times, I was expected to know. My first attempt failed. I somehow messed up the yeast by making the water too hot when trying to “proof” it. Silly me still added it to the flour, but no matter how much my tiny hands rolled that dough, it refused to rise. It was a total waste of about five pounds of flour – a commodity at the time. Back then; such a blunder was ironically punishable by spanking across the buns. Over time, my skills improved tremendously, but I favored baking cake over bread. So at Christmas and other special occasions, I was the one called upon to make the cake. It was a specialty that found favor with my first boyfriend’s mom. To this day, I am convinced that’s one of the reasons why she invited me to move into their home – for two years! Once I started living on my own, I put baking on the back burner – from weekly to every few months. My excuse was the hectic 12-hour days in the newsroom. Or maybe, I was spoiled by the fact that I could easily get my mom to bake for me. I then made it a weekly habit to travel from my south coast home near the beach to the rural center of the island surrounded by cart roads and gullies to my mother’s house. There, she’d have waiting for me, my favorite — coconut bread — and other tasty samplings of: Bajan coconut turnovers; salt bread; fruitcake; cassava pone – whatever was coming out of the oven. Traveling to mommy for these delights became one of my favorite pastimes for several years until I moved to New York. Perhaps, it was the constant feeling of being homesick, the fact that I was on a budget being a full-time student etc, or I just needed to taste something authentically Caribbean, or all the aforementioned factors, but within my first two months in New York, I started baking again. Seven years later, I am still baking almost every week. And I have found myself doing just what my mother does – sharing baked goods with neighbors and friends. My friends are so confident my cupboards are always stocked with ingredients, that they have at times shown up unannounced and asked me to bake bread. With pleasure I oblige. Almost everything I bake is from the “unwritten” recipes handed down through my family, mainly my grandmother and mother. I feel like it’s important to uphold this tradition, especially living so far away from home where it is challenging to keep a firm grasp on one’s Caribbean roots. I get great gratification in treating my West Indian friends here to a taste of home. But my greater joy comes from sharing this significant part of my heritage with an ever-increasing circle of friends from all across the world, people who like me, make their home in this amazing multicultural city. In the attached video, I’m featuring my preparation this past week of one of the delightful baked goods traditionally made by my family. I hope you enjoy. Well written as usual. I haven’t had the pleasure of tasting the baked goods you speak. However, if your baking is anything like your cooking I’m sure I have missed much. Thanks for sharing a a moment of your roots and culture. Thank you Jackie! One love.